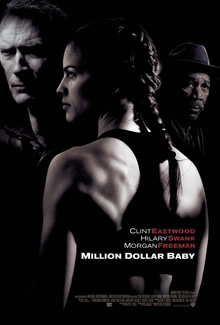 The first time I saw Million Dollar Baby, I had a very strong antithesis towards it for a variety of reasons. I thought it extremely dour and morose, with no sense of hope. I also strongly disagreed with the outcome and felt it was frankly too depressing to see again. Now, nearly fifteen years after its release, I revisit Million Dollar Baby and find that it has more flaws than I first remembered. Given how rarely if ever I hear people talk about it or remember how it won four Oscars including Best Picture, I find I'm not the only one who doesn't remember it. Told in voiceover by Scrap (Morgan Freeman), we learn of Frankie Dunn (Clint Eastwood): a cut man and trainer, who runs a boxing gym. He is an isolated man, his daughter Katy returning all his letters and having no other family or friends save Scrap, whom he's known for thirty years and works at the gym. Dunn attends Mass almost every day but seems to go more to pester the priest (Brian O'Byrne) than true spiritual clarification. The gym has a collection of oddballs, but there is one who comes in to take charge. That's Maggie Fitzgerald (Hillary Swank), a hillbilly refugee from the backwoods of Missouri who wants to be a boxer. Dunn is outwardly a sexist, refusing to train girls, which he sees as a freak show. However, she's scrapped up enough money to pay for a six-month membership, and she works with the silent help of Scrap to get Dunn to modify his views. Eventually, his love of boxing overrides his hesitation and he becomes part mentor, part father figure to Maggie, especially since his former protege has left him to pursue a shot at a title which the overly cautious Dunn keeps delaying. Maggie, despite being at 31 rather old to begin her career, soon starts winning bout after bout, usually in the first round. Maggie soon starts making a name for herself, especially after a very successful European tour where she is given a new name, "Mo Cuishle", a Gaelic term Dunn had sewn onto Maggie's robe and whose meaning he won't tell her. With this success comes Maggie's hope to be Somebody and help her uber-white trash family. Maggie buys her Mama (Margo Martindale) a nice home, but Mama ain't happy. In fact, she's appalled: her new house might mean her welfare and Medicare might get cut off. Eventually, having risen in rank, Dunn finally agrees to put Maggie up against Billie "The Blue Bear" (Lucia Rijker), a former East Berlin prostitute who is known as the dirtiest boxer in female boxing. The fight seems to be going Maggie's way, until she is literally sucker-punched, causing her to fall onto the stool and breaking her neck. Now paralyzed from the neck down and unable to breathe, Maggie at first seems to think this might be another fight to take on. That is, until she starts suffering from bedsores, then having her uber-white trash family finally come. Although they've been in town for at least six days, they haven't rushed to Maggie's side. Instead, when they finally do come to the hospital, they are dressed in garish Universal Studios t-shirts, clearly showing they went to amusement parks rather than the disabled Maggie. Making things worse, Mama and her brood brought a lawyer with them so that Maggie can sign her property over to them, Mama putting a pen in Maggie's mouth so she could sign. Maggie orders her white trash family out, then later asks that Frankie 'help her die'. Frankie struggles with this: at first flat-out saying no, then softening when he learns Maggie bit off her tongue to bleed to death. He consults the priest, but in the end becomes Maggie's Angel of Death and revealing what 'mo cuishle' means: my blood, my pulse. We learn that the voiceover dominating Million Dollar Baby was a letter Scrap had or was writing to Katy explaining what kind of man Frankie Dunn is, along with learning Frankie was never seen or heard from again. That, however, is not entirely true, as we catch perhaps a glimpse of him at a diner he and Maggie went to out in the Ozarks, where they serve the best lemon pie he's ever had. Let's cut to the chase here: Million Dollar Baby touches on a fiery issue, or issues. The first is euthanasia, and how one sees the subject most likely will inform how one ultimately receive the film. I am firmly opposed to euthanasia. If Million Dollar Baby was meant to change my mind, it didn't, because there wasn't much in Paul Haggis' adaptation of Rope Burns, the short story collection by F.X. Toole, that provided much of a counterpoint. We saw a brief discussion with a priest, but that didn't delve into any actual aspects beyond 'this is wrong'. The Golden Girls episode Not Another Monday was more balanced, and ultimately more optimistic. Granted, as a sitcom it had to be, and there were other differences such as the person's age and 'disability'. 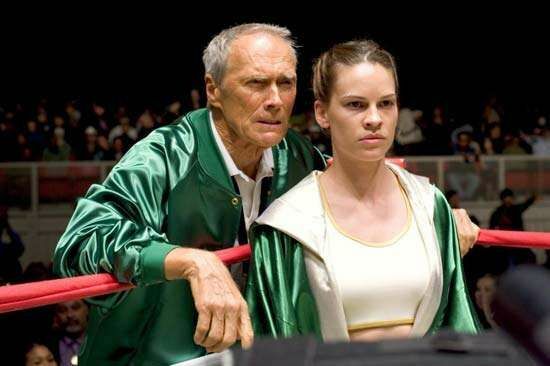 However, I never got the sense that Million Dollar Baby was intended as a paean to assisted suicide. It can be seen that way, but that's up to the viewer. A more troubling aspect is what it might say about those who are disabled and the idea that if one does not have full mobility, especially after losing it, it would be better if that person died. That is a more dicey element, one that makes me very uncomfortable, and one worthy of greater debate than can be given here. Million Dollar Baby right off the bat is clearly not an optimistic picture. You can tell right off the bat from the music, which is somber throughout. There's just a pervading sense of gloom, of hopelessness throughout Million Dollar Baby, which makes its embrace by others puzzling to me. The performances were solid, as can be expected from a craftsman like Eastwood, but they were also similar to what they've done before. Eastwood can do surly in his sleep, though here he does show a greater vulnerability than we've seen in previous films. As the narrator/conscience, Freeman does not stretch from what we've seen him do in other films. Swank was lauded to an Oscar for her Maggie, but I wonder if her 'hillbilly with a heart of gold' performance holds up now. My biggest problem after seeing it again is with Haggis' screenplay. It is surprising to find Jay Baruchel, Anthony Mackie and Michael Peña all in small roles here (as a side note, wonder if we could get Baruchel into the Marvel Cinematic Universe to complete the set). However, could their subplots have been trimmed or removed without affecting the film? After Baruchel's dimwitted "Danger" leaves only to come back at the end, one wonders what ever happened to him. I also have a big issue with voiceover, which I have always had. If this is a letter Scrap is writing to Katy, it's the size of a novel. I think in Million Dollar Baby, voiceover was used too much. Finally, I disliked the constant foreshadowing in the film. We had constant shots of the ringside stool coming up, and it is interesting that when Maggie's neck was broken, it was when we saw the stool placed sideways rather than upright as it had been each time prior. Moreover, when we hear Maggie recall a story about how her beloved Daddy put his dog down, we are forced into seeing the future. I was once dismissive of the uber white trash family, but having seen some of the boorishness of other families, I can see it isn't far from the truth, if not particularly subtle about things. Maybe it's the overt call-outs to Catholicism that make me question of perhaps Million Dollar Baby was going slightly over-the-top. There's Maggie's actual name of "Mary M.", which suggest more Mary Magdalene than Mary Margaret. There's Dunn's visits to the Church, but no sense of salvation. Something did not quite fit for me. I don't think the film, looking back at it now, is as good as it was proclaimed to be. It is not a terrible film on a technical level. It is well-acted, well-directed, well-shot, if not particularly well-written. I just felt cold after watching Million Dollar Baby. Cold and somber. I think that was what it was aiming for. It does not mean however, that I have to love it because it met its goals.